Every artist will tell you that all good tattoos begin with a good stencil, and we now stock the very best. Sunset Tattoo are excited to announce that we are now proud distributors of Anchored Stencil Solution, by world-renowned artist Nikko Hurtado. Born in California in 1981 to Hispanic heritage, Nikko Hurtado grew up in the high desert drawing cartoons and characters for fun. He went to the Art Centre of Pasadena for a few years in his teens, but it wasn’t until his early 20s when Nikko’s career changed. After calling in to see a friend in his tattoo studio, he was offered an apprenticeship. He started tattooing the next day. After years of development, testing, trial and error, Nikko Hurtado has perfected a tattoo stencil solution. With his own unique formula, the respected tattoo artist has created an effective solution, producing crisp, clear lines which last for hours. Guaranteed to be loved by tattoo artists around the world, this special tattoo stencil solution provides an even truer representation of the original drawing. The long-lasting formula will stay crisp for hours, allowing you to work from start to finish without having to worry about fading or missing parts of the design. Sunset Tattoo have also been in the game a long time, and we’ve discovered what works and what doesn’t. That’s why we started our own Tattoo Supply store, Tattoo Station with all the equipment and essentials that we use ourselves for our work. We sell everything from our own special range of Botan Needles, through to the world famous Eternal Ink, and now we’re delighted to add Anchored Tattoo Stencil solution to the list. Contact us today if you have any questions about our range. 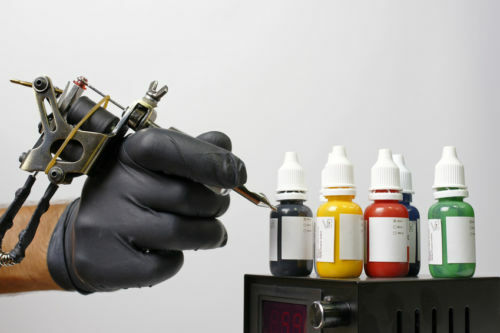 Tattoo artists who have been in the industry for long enough, know the difference between quality tattoo supplies and the difference they make to the finished product. That’s why artists in New Zealand know to come to Sunset for their tattoo supplies. Our sister company, Tattoo Station, started from humble beginnings, and has quickly become one of New Zealand’s finest tattoo supply companies - all within the space of a year. Sunset started as somewhere we could create artwork, in many different media, without stress or pressure, and in a few short years we are now attracting some of the best tattoo artists in New Zealand, and overseas. This studio may only be a few of years old, but we’ve all been in this business a long time, and after years of buying tattoo supplies at huge mark-ups from people who don't even tattoo, we became frustrated and decided to do it ourselves. That’s when Tattoo Station was born. Tattoo Station is a tattoo supply store by tattoo artists for tattoo artists. Forget the companies making a fortune off our backs; we’re bypassing them altogether. We design and make our own tattoo supplies, and with combined decades of experience in the industry, we know exactly what works and what doesn’t. We supply some of the highest quality needles in the world with our Botan range, along with one of the best aftercare creams available on the market, Protat. We’re the official supplies in New Zealand for the world famous Eternal Ink, and we’re now selling Senders Widows, beautiful, hand-made tattoo machines. Add to that the usual tattoo studio essentials, and we’ve got you covered for all your tattoo supply needs here in New Zealand. Forget ordering from overseas, along with their huge mark-ups. Stay in local, support Kiwi business, and save money and time while doing it. Sunset tattoo are now in the tattoo ink supply business! And what a range we have for you tattoo artists out there! We are proud to be an official distributor of the world-famous Eternal Ink. Made from organic pigments, de-ionized water and hamamelis water, this bright coloured ink is free of animal by-products and even suitable for vegans. They arrive sealed in a medical grade bottle, ensuring hygiene, and the ink pigments are regularly tested and comply with all health and safety regulations. Eternal Ink is not tested on animals, so there’s no guilty conscious tagging along with every purchase. Check out our sister site Tattoo Station for all your tattoo supply needs, including the incredible Eternal Ink. The amazing Liz Cook created this palette of colours. The set features a vibrant collection of rich violets and some eye-catching greens. Chucks Seasonal Spectrum Series features an assortment of colours found throughout the seasons. You'll love the colourful range of warm and cool hues. Detroit put a nation on wheels and rolled us through a lifetime of memories. The Motor City Ink Set is a flashback to Detroit speed. Here are 12 hues inspired by vintage sheet metal fantasies, high gloss paint and all the reckless joys of a fine ride. Designed by tattoo artist Halo, the Eternal Ink Halo Fifth Dimension ink set collects 12 opaque hues of intense light Use the hues straight from the bottle as complementary or as high-value tints to quickly provide additional pop and impact to your art! The Eternal Ink portrait series has been designed to give depth and contrast to portrait work. With warm and cool tones, this set blends a perfect assortment of colours for portrait and pin-up work. Myke Chambers' art is instantly recognizable with rich, saturated hues and strong symbolic images inked in his unmistakable style. Presented here are 12 of Chambers' favorite hues mixed perfectly to Eternal inks high standards. Sunset now sell their own tattoo supplies! Sunset Tattoo are excited to bring you our new sister site: Tattoo Station. If you’re looking for great deals on high-quality tattoo products and equipment, then look no further. We only sell the very best of everything, all at an unbeatable price. Here at Sunset, we've been in the tattoo business for a long time. We know the difference between quality and cheap knock-offs. That's why we only get out supplies from Tattoo Station. Our sister company, Tattoo Station, started from humble beginnings, and is quickly becoming one of New Zealand’s finest tattoo supply companies, and all in an incredibly short period of time. Sunset started as somewhere we could create artwork, in many different media, without stress or pressure, and in two short years we are now attracting some of the best tattoo artists in New Zealand, and overseas. Tattoo Station is a tattoo supply store for tattoo artists, by tattoo artists. We supply some of the highest quality needles in the world with our Botan range, along with one of the best aftercare creams available on the market, Protat. Forget ordering from overseas, along with their huge mark-ups. Stay in Aotearoa, support Kiwi business, and save money and time while doing it.